There are several photos on this page. Please scroll down the page to view them all. 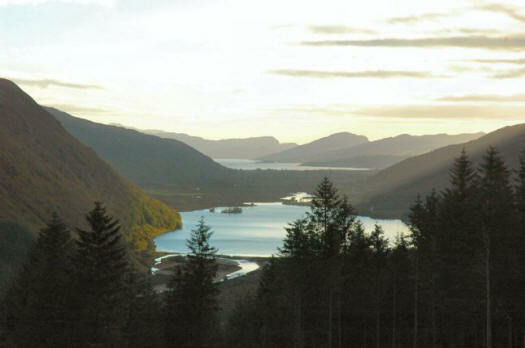 Lochcarron lies amidst some of the finest scenery in the British Isles and is an absolute paradise for all those who love the great outdoors. Many people who visit this beautiful area do so to escape from it all, to get away from the hustle and bustle of modern life, and to enjoy the peace and tranquillity and the truly spectacular views - it is an ideal spot for walkers, photographers, and artists. And, the scenery can be even more spectacular in the winter-time - as the photo below demonstrates. 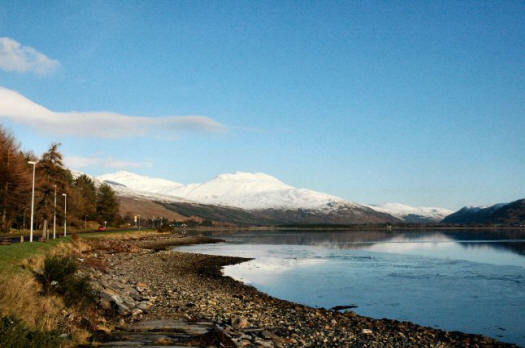 This shows the view from the shore in Lochcarron village with a snow-covered "Wellington" in the background, and was taken on a superb bright sunny day at the beginning of December. For those who are energetic enough to the walk up the steep track which leads from the road to the TV relay station, the reward is some even more magnificent views, especially if one ventures out across the open mountain top. 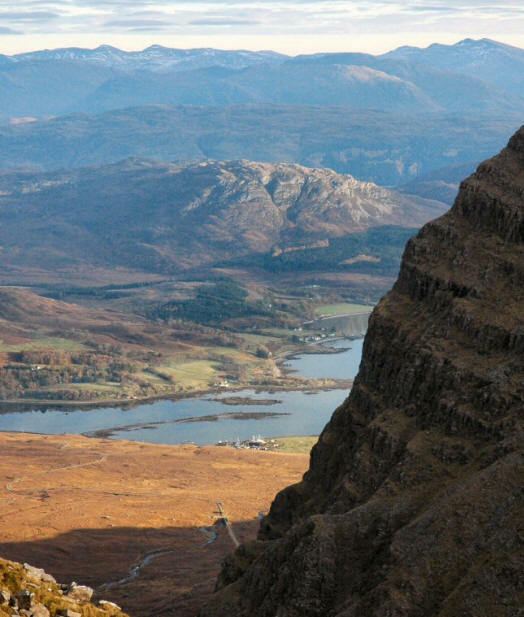 Below we can see a dramatic view down to Kishorn as seen from the Applecross tops. Continuing on down the other side from the Applecross tops one reaches the pretty little village of Applecross with the very popular Applecross Inn. Applecross feels like a real haven of peace and tranquillity after the high drama of the ride over the top and there are beaches and several waymarked walks. 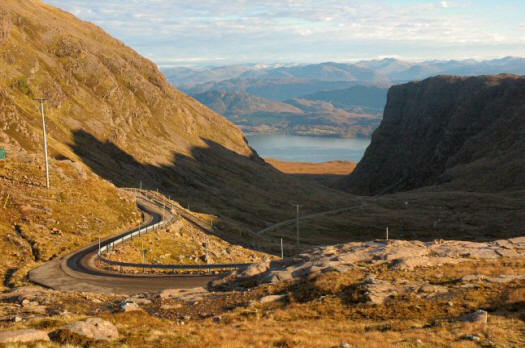 A popular conclusion to a visit to Applecross is to do a round trip tour by following the coast road right around the Applecross peninsula, eventually re-joining the main A896 near Shieldaig. 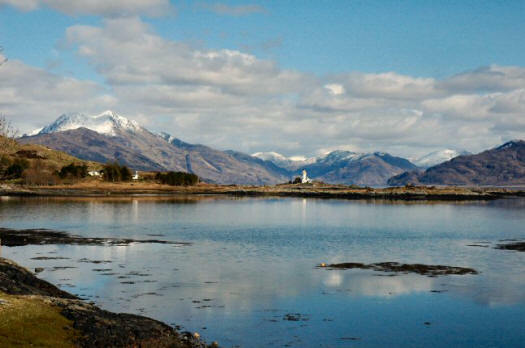 There are superb views to be seen all along this road and you will pass the site of Monty Halls' Beachcomber Cottage at Sand just up the coast from Applecross village. Nearer at hand to Lochcarron is Glen Carron from which there are several circular and linear walks, some of the latter going through to Torridon and Glen Torridon. 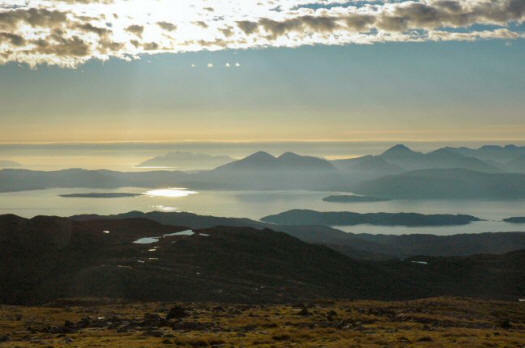 Below is a late evening view from the Coulin Road near Achnashellach looking towards Loch Carron in the far distance with Loch Dughaill in the foreground. By taking Church Street from Lochcarron village and continuing out through the west end of the village, one reaches North Strome where the old Stromeferry slipway can still be seen. 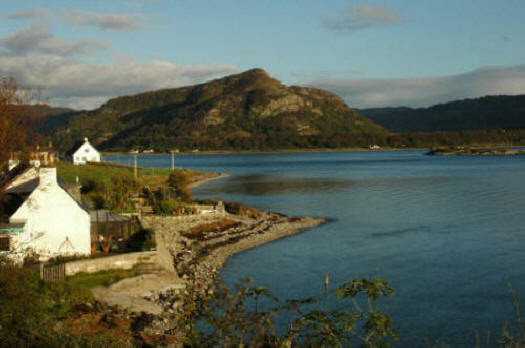 The ferry became defunct in the 1970's when the Stromeferry By-Pass was opened along the south shore of Loch Carron but prior to this the ferry was the only route into the village from the south. Nearby are the ruins of Strome Castle.